Call 877-209-9648, or email sales@pasafety.com to reserve a date for your Aerial Work Platform Training. We travel throughout the country teaching the EPA Lead Renovator Training course. So, if you can work around our schedule, many times there isn’t a fee for us to travel to you. We also can host the training course at our facility located in Cincinnati, OH. Contact us today to find out more. We are member of the Better Business Bureau and over 98% of our google verified reviews are 5 out of 5 stars. Our mission to reduce workplace accidents and injuries so we enjoy travelling and spreading the word of safety. Also, we offer free phone consultation for anyone who takes a course with us and discounted personal protective equipment and support through our partner at ABCO Safety Jeff Bayer. Are you aware that over 30 people die every year in the United States of America from Aerial Workplace Accidents? Typically, over half of those cases will involve an operator who wasn’t properly trained. Having an untrained workforce leads to high turnover, low employee morale, accidents, injuries, and possibly OSHA fines. Having trained operators will help mitigate these negative consequences. Does your company struggle to keep up with your training requirements? Does employee turnover make it difficult to keep up with the training requirements? Possibly, you are simply concerned about the danger an Aerial Work Platform brings to your workforce? The Occupational Health and Safety Administration requires that all Aerial Work Platform operators receive training prior to operation, and every 3 years thereafter. Training needs to be conducted for every type of Aerial Work Platform that will be used. Fines start at $17,200 for first time violations and increase to over $76,000 for willful violations. Since the fines went up in 2015, it is no longer worth the risk to go without training your workers. With our Aerial Work Platform training course, we guarantee a professional trainer and a quality training experience. Since 2009 we have instructed hundreds of Aerial Work Platform courses, and our trainers enjoy what they do! Our fast-paced interactive course will provide your staff with the tools they need to operate Aerial Work Platforms safely. Our training will include explanations of electrical, fall, and falling objects hazards. Demonstrations of the skills and knowledge needed to operate an Aerial lift before operating it on the job. Understanding and recognizing unsafe conditions. Instructions on how to correctly operate the lift. When and how to perform inspections, and where to find the manufacturer’s requirements. 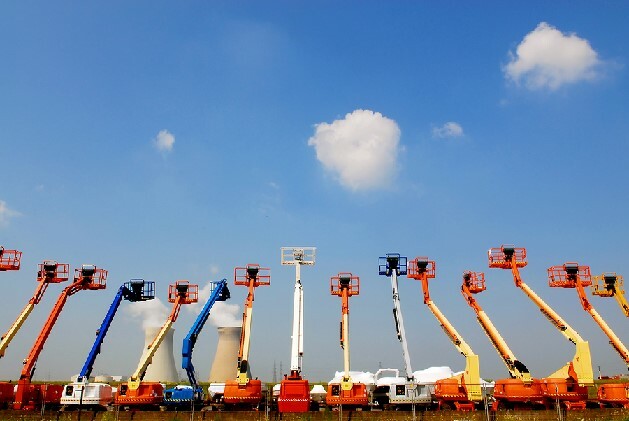 What are the scenarios where retraining of Aerial Work Platforms is required? If anyone is involved in accident during the use of Aerial Work Platform retraining should take place immediately. If new hazards are discovered within the workplace, and if you change the type of Aerial Work Platform used make sure to get an Aerial Work Platform training scheduled. Refresher training is recommended every 2 years and must be conducted every 3 years. Do I need to wear a harness and lanyard when I operate an Aerial Work Platform? There is a gray area here that some companies choose to take advantage of. However, we recommend that you should also wear a harness and lanyard to protect against falls out of the Aerial Work Platform, and possible ejection during user or hydraulic information. How much does an Aerial Work Platform Training course cost per class? Typically, our Aerial Work Platform class costs $895. This will allow you to enroll 12 students at your location. Travel fees maybe associated if you can’t work around our current travel schedule. This will depend on the variety of Aerial Work Platforms your company uses. If you only use a boom and a scissor lift the course will typically last between 3 – 4 hours with the hands-on activities. If you have 4 or 5 machines the course could take up to 5 -6 hours. Does proActive Safety Services provide an Aerial Work Platform for the class? We prefer to train on the equipment that your employees will use. However, if that isn’t feasible we can arrange a rental through a local tool rental company. Typically, we pass the cost of the rental onto you. How often do Aerial Work Platforms need to be inspected? According to the Occupational Health and Safety Administration a pre-start inspection should be conducted prior to each work shift. The vehicle components to be inspected should include fluid levels, leaks of fluids, wheels and tires, battery and charger, lower-level controls, horn, gauges, lights and backup alarms, steering, and the brakes. The lift components inspected should include the operating and emergency controls, personal protective devices, hydraulic, air, pneumatic, fuel and electrical systems. Any fiberglass or insulating components, warning labels and placards, mechanical fasteners and locking pins, cable and wiring harnesses, outriggers, stabilizers, loose or missing parts, and any guardrail systems. Registering is easy! Simply email sales@pasafety.com or dial 877-209-9648. You can buy with confidence when you register for a training course with us. We guarantee a professional trainer who will deliver a fast-paced interactive course. If you are unhappy with our training course we will refund your training fee and credit your account the price of the course. We are member of the Better Business Bureau and over 98% of our google verified reviews are 5 out of 5 stars. Our mission to reduce workplace accidents and injuries so we enjoy travelling and spreading the word of safety. Also, we offer free phone consultation for anyone who takes a course with us and discounted personal protective equipment and support through our partner at ABCO Safety Jeff Bayer. Our Aerial Work Platform Train the Trainer Course is just one example of many Train the Trainer Courses we can provide for your business. It covers explanations of electrical, fall, and falling objects hazards. It also consists of demonstrations of skills and knowledge needed to operate an Aerial Lift before operating it on the job, understanding and recognizing unsafe conditions, instructions on how to correctly operate the lift as well as when and how to perform inspections, and where to find the manufacturer’s requirements. This Aerial Work Platform Train the Trainer course provides your employees with proper instruction techniques, so your trainer will be able to demonstrate and relay important procedures to the rest of your crews during future onsite trainings. Students will learn the best practices for conducting such trainings along with having the authorization record and obtaining certifications for their students. Our Aerial Work Platform Train the Trainer Course, as well as our other Train the Trainer courses, are a great option for organizations looking to have one or more employees that can teach and certify various safety topics relevant to your business. Having a trainer on your crew can greatly diminish the number of incidents at the workplace. By pro-actively training your employees and offering them an onsite trainer, you are making a long-term investment in their safety. Having an on-site trainer will help keep your company in compliance from OSHA fines as well as help you continue to protect your most valued asset, your people. Dial 877-209-9648 or email SALES@PASAFETY.COM to register.